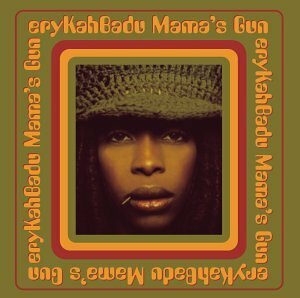 I actually intended to talk more about individual tracks on here than full albums, but I had to make an exception for Mama’s Gun! I first discovered this album when it was released 15 years ago, and I remember the exact period of my life when I was getting into it like it was just last week! It’s funny how music helps you to recapture memories like that! There has been a lot of research around the link between music and memories, you can read a little here. But anyway, back to the album, this was during the period when neo-soul was just taken off, with albums like India Arie – ‘Acoustic Soul’, Alicia Keys – ‘Songs In A Minor’, and Jill Scott – ‘Who Is Jill Scott?’ all coming out in a very short space of time. After the years of 90s R&B, the influences of the old soul artists blending with a more modern sound was refreshing! Erykah brought something even more unique to the mix, there was jazz, blues, and a bit of the Erykah craziness all thrown in! This was far removed from cookie-cutter R&B! This album still remains a classic for me. It just has such a warmth and authenticity to it that can never get old. Highlights tracks for me are ‘Didn’t Cha Know’, ‘…& On’, ‘Orange Moon’, ‘Bag Lady’, and ‘Green Eyes’. Coldplay – To Love or To Hate?